In late February 2016, Google removed (with minimal warning!) the right hand ads on it’s desktop SERPs. (http://searchengineland.com/google-no-ads-right-side-of-desktop-search-results-242997). Google replaced the right hand adverts with a new four-pack of ads at the top of the SERP, and up to another four at the bottom – well below the fold. In effect, this makes desktop SERPs look much more like their mobile cousins. As you can imagine, there were rather a lot of worried phone calls between clients, agencies, and Google when the news came out. 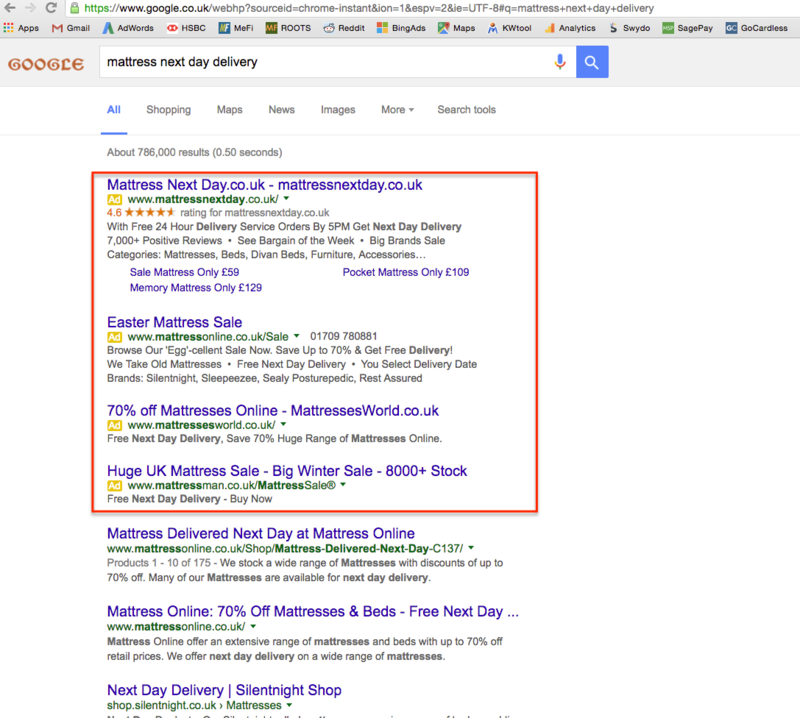 The concern amongst agencies and SME sized advertisers was that this would drive click costs up (good for Google! ), create a bidding war for the top-of-page four pack where presumably all of the traffic would be (good for Google! ), and create a barrier to entry for small and medium budget advertisers who would not be able to complete with deep pocketed advertisers for top spots (bad for everyone else). We looked at a cross section of our SME sized client’s in both ecommerce, B2B and lead generation to see how March has shaken out in terms of Cost per Click. The results are: Right Hand Ad Armageddon was a whole lot of nothing. A B2C service client in a competitive UK nice. This trend has remained the same when controlled for other variables across our client base. CPCs have remained relatively steady, along with positions across our client base. In fairness, our client base was relatively immune by dint of already being quite lean and mean – either occupying positions 1-3 or not at all. Over the next few weeks, we’ll isolate and share trends that we see as a result of the change to the SERPs so that we can show a proper, long-term effect. Early indications are that Shopping Ads are the new turf everyone is fighting over. It makes sense – they now dominate the right hand side of the screen, and show more frequently at the top for commercial searches.